Ask any cybersecurity professional and she’ll tell you that her job is getting increasingly difficult. Why? Most will point to a combination of the dangerous threat landscape, IT complexity, and their overwhelming workload. These issues are driving a major transition in enterprise security. 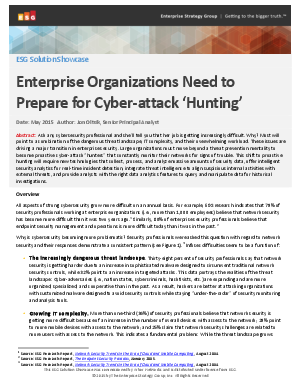 Large organizations must move beyond a threat prevention mentality tobecome proactive cyber-­-attack “hunters” that constantly monitor their networks for signs of trouble. This shift to proactive hunting will require new technologies that collect, process, and analyze massive amounts of security data, offer intelligent security analytics for real-­-time incident detection, integrate threat intelligence to align suspicious internal activities with external threats, and provide analysts with the right data analytics features to query and manipulate data for historical investigations.